Distribution: Although this species is endemic to California, it has mostly disappeared from the Central Valley and is no longer present in southern California. Several occurrences remain in Sacramento County along the American River Parkway, and records exist for Butte, Del Norte, El Dorado, Fresno, Merced, Mariposa, Orange, Placer, Shasta, San Joaquin, Tehama, and Ventura Counties. Although it is not known to grow in the Natomas Basin, the closest known occurrence is about one mile (two kilometers) southeast of the basin along the American River Parkway. Habitat Requirements: Sanford’s arrowhead grows in shallow, freshwater marshes and swamps at elevations lower than approximately 2,100 feet (650 meters). 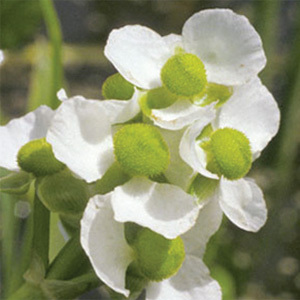 Demography: Sanford’s arrowhead is a perennial rhizomatous herb that blooms from May through October. It is a member of the water plantain family (Alismataceae), and the rhizome of Sanford’s arrowhead has been a source of food to native cultures and waterfowl. It grows in standing or slow-moving freshwater ponds, marshes, and ditches in association with the water plantain (Alisma plantago-aquatica), water primrose (Ludwigia peploides), and various species of cattail (Typha spp. ).